In this post-(post? )industrial era, as in all eras, there is a culture and a counter-culture. And then there are hipsters, trying to out counter them all. But setting aside the extreme non-conformists, there are two trends in the design world. One is epitomized by Apple, with sleek gadgets and perfectionistic design ideals. You want it because it works, it’s beautiful, and everyone else has one. It’s more than just a gadget, it is a way of life. Well anyways, thats what the marketers want us to believe. And as I sit typing on my Macbook Pro, with my iPhone near to hand, I admit to being taken in by the idealistic dreams the brand purveys. But at the same time, I also recognize that everyone else has one. And that miniscule streak of non conformity inside me demands that I at least manage to be a bit different than everyone else. Because otherwise, I couldn’t feel special and different, and yes a bit superior. And so, I find myself simultaneously jumping on the handmade bandwagon. There are two shopping websites that I think show these contrasting trends quite well. Fab is an addictive, bank account draining website full of young designers. Overall the mood is sleek but bright, full of carefully designed items with deliberate touches of quirk all over the place. It’s about as “now” as design could be, and pursues the “design for everyone” ideals. Browsing their incredibly fun website, I always feel very in the know and wealthy, as if I have all sorts of free time and access to chic little boutiques. It is fortunate then, since I have and am none of those things, that I have the skills to make my own versions of some of the jewelry. Which brings me to the countering culture that is Etsy. Here the motto would be altered to “everyone can design”. It celebrates the ‘do-it-yourself’ers, the ‘young designers who haven’t made it quite big enough to get onto Fab’ers, the ‘why the hell should I spend 100 bucks on a necklace I can make myself’ers and countless other ‘ers. Maybe it’s not quite perfection, but it’s made by a person and not a machine. Plus, it’s probably something your neighbor doesn’t have. Not that we think about that sort of thing. Shark Pencil case that bites you? Two please. 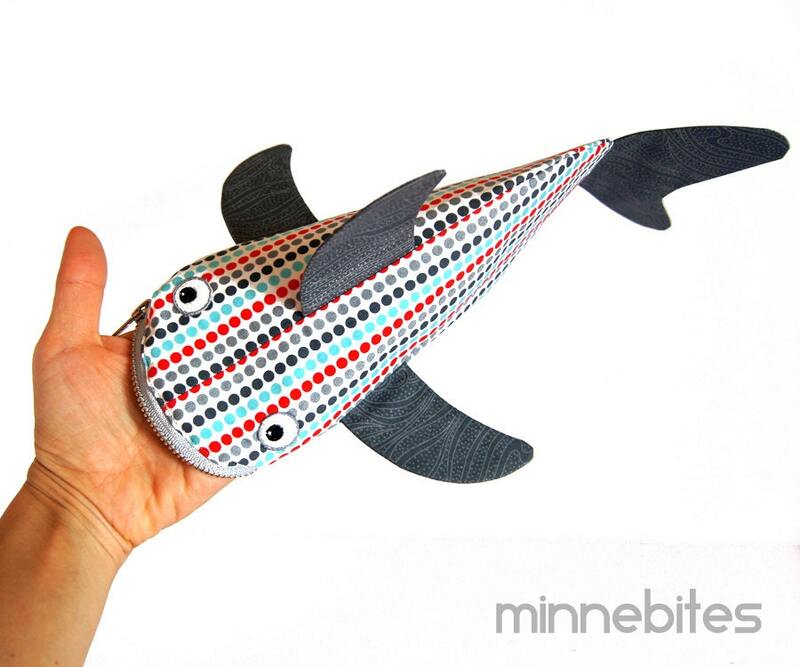 Modern Dots Shark by Minnebites / Pencil Case on Etsy. Despite the fact that I just painted those websites and their cultures as being diametrically opposing, I think the root cause of each is pretty similar. What both of these websites have in common is that the people visiting them are searching for things with a bit more depth to them. Whether it is a one of a kind handmade bag, or a well designed spoon that someone spent a lot of time designing, I think we are searching for a human element that’s hard to find in the mass produced world. A cool print by a new artist is just a different way of connecting than a Doctor Who themed knitted hat. When everyone has most of the same (or at least similar) things, having something a bit different is a coup. We might all want the same phone, but we want the case to be different. Fab.com might be all about the new, but it also does a huge business in vintage items. Vintage is popular not only because of basic supply and demand principles, mystic that history gives an item. Being old means it has a past, a story that we can connect to. Think of the popularity of vinyl records in this age of mp3s. Sure they can only hold a tiny amount of data in a fragile and inconvenient way, but it has more soul. That doesn’t stop us from listening to the same album streaming from the cloud when we’re at work. Convenience still trumps generally. But once in awhile, we need a bit more soul. The obviousness of this trend was pointed out to me on a trip to Sturbridge Village. While wandering among the centuries old houses and exclaiming at the sheep and cows, you also have the chance to view demonstrations of craftspeople working. I could have watched the blacksmith make historically accurate items all day. But while his trade was his main occupation, every other craftsmen carefully explained that they were farmers. The craft they knew was a side job learned from their father. They didn’t even need to like it, but it was necessary that someone do it to make the village self sufficient. It wasn’t cool at all to be able to make something. In fact, if you had to make thing yourself it was a dead giveaway you were poor. “Why would anyone want what I make?” demanded the potter, while sculpting an egg stand in front of our fascinated eyes. “They could go dig up some clay and make it themselves. Everyone wants porcelain factory goods. This egg stand would be given to a child, because it wouldn’t matter if it broke. You want to know what I make the most of?” he turns away and grabs a large, deep bowl. “Bowls for milk. Dairy farmers need a ton. And chamber pots” Glamourous his job was not, and while it was important it wouldn’t be too difficult to train a new potter if he dropped dead, which was probably a legitimate worry given Colonial America’s death statistics. What Colonials desired were the expensive and hard to obtain factory goods imported from England. The potter even mentioned that if he was making things historically accurate, he would be carefully removing all traces of ridges his fingers were creating. However, since his buyers were actually 21st century tourists who coveted the handmade, he left them on. My conclusion is that no matter if it’s the 17th or 21st, people want what no one else has. If everyone can have it it will quickly become passe, and value of an item fluctuates over time. Those who preach enlightenment through the avoidance of materialism are probably on to something. After all, the object in question only has the meaning and depth we apply to them. So those 600 dollar shoes aren’t really as good as I think they are… right? Well, I’ll work on it.